جامعة لا تروب، هي جامعة بحثية عامة أسترالية يقع حرمها الرئيسي في ضاحية بوندورا، ملبورن. تأسست الجامعة عام 1964، لتصبح ثالثح جامعة في ولاية ڤكتوريا، والحادية عشر في أستراليا. لا تروب هي جامعة verdant وعضو الجامعات البحثية المبتكرة. الحرم الأصلي والرئيسي لجامعة لاتروب يقع في منطقة ملبورن الحضرية، في ضاحية بوندورا. وهو أكبر حرم حضري في البلاد. [Note 7] وللجامعة حرمين آخرين يقاع في مدينة بنديگو والآخر في البري-وودونگا بولاية ڤكتوريا. للجامعة حرمين محليين في ميلدورا وشپارتون وثلاثة آخرين في مناطق أعمال مركزية: واحد في شارع فرانكلين في ملبورن، والآخر في شارع كولينز والثالث في شارع إليزابث، سيدني. توفر الجامعة برامج جامعية ودراسات عليا من خلال كليتيها، كلية الفنون والعلوم الاجتماعية ولتجارة وكلية العلوم والصحة والهندسة. عام 2015 كانت تحتل الترتيب الأول على 100 جامعة ضمن تايمز هاير إديوكيشن ترتيب جامعات العالم. تعتبر لا تروب الجامعة الأقوى في مجال الفنون والإنسانيات؛ الذي انعكس في ترتيب كيو إس لجامعات العالم 2014 حيث كانت على قمة 200 جامعة دولية للفنون والإنسانيات. مبنى موت أند جورج سنگر، حرم جامعة لا تروب في بوندورا. 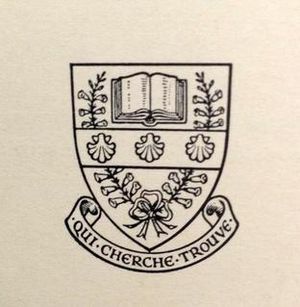 Initial brandmark of La Trobe University. ^ The Coat of Arms were granted by the College of Arms in 1966. "and assign unto La Trobe University the arms following that is to say Argent a chaplet of Common Heath proper tied with a Riband Azure and encircling in chief an open Book proper bound and over all on a Fess Gules three Escallops Argent And for the Crest On a Wreath Argent and Gules Perched on a Parchment Scroll an Australian wedgetailed eagle wings inverted proper supporting with the dexter claw an Escallop Argent". ^ As the institution is named after a person and not a geographical location, the correct terminology is La Trobeana and not La Trobensis. For reference see Sandys and his preference for Universitas Yaleana over Universitas Yalensis in John Edwin Sandys, Orationes Et Epistolae Cantabrigienses 1876–1909 (London: Macmillan & Company, limited, 1910), viii, accessed 17 Nov. 2015. ^ Since the second heraldic colour is Argent, grey may alternatively be depicted as white. ^ The use of black dates back to the early years of the university, most likely originating from the La Trobe University Football Club. When La Trobe first opened in 1967 its sports clubs used the University of Melbourne as a benchmark to emulate. One outcome of this was the creation of the La Trobe University Reds and the La Trobe University Blacks in 1968, which was based on the University Blues and the University Blacks at Melbourne. 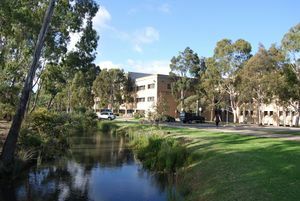 ^ The Melbourne Campus is situated on 267 hectares of land. ^ J. R. Archibald Glenn (1989). "The Planning Phase". In William J. Breen. Building La Trobe University: Reflections on the first 25 years 1964–1989. Melbourne: La Trobe University Press. pp. 21–29. ISBN 1-86324-003-9. ^ Public Record Office of Victoria, 'April 2013 - Showcase Record', Facebook, viewed 15 Jan. 2015. ^ أ ب ت ث ج See La Trobe University, '2015 Pocket Statistics', La Trobe University, (2015), accessed 19 Jan. 2016. ^ La Trobe University, 'University Handbook 2014', La Trobe University [website], (2014), accessed 20 Jan. 2015. ^ Times Higher Education, '100 Under 50 Rankings 2015 results', Times Higher Education [website], (2015), accessed 9 Jun. 2015. 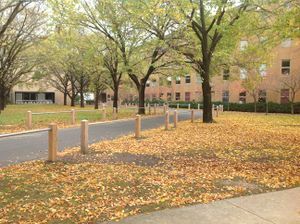 ^ La Trobe University. "Colleges". Retrieved 17 July 2015. ^ أ ب "QS World University Rankings 2019". Quacquarelli Symonds Limited. ^ أ ب "CWTS Leiden Ranking 2017". Centre for Science and Technology Studies, Leiden University. ^ "All unis winners in research audit". The Australian. 4 December 2015. Retrieved 21 February 2017. William J. Breen, ed. (1989). Building La Trobe University: Reflections on the first 25 years 1964–1989. Melbourne: La Trobe University Press. hdl:1959.9/201688. ISBN 1-86324-003-9. مشاع المعرفة فيه ميديا متعلقة بموضوع La Trobe University.